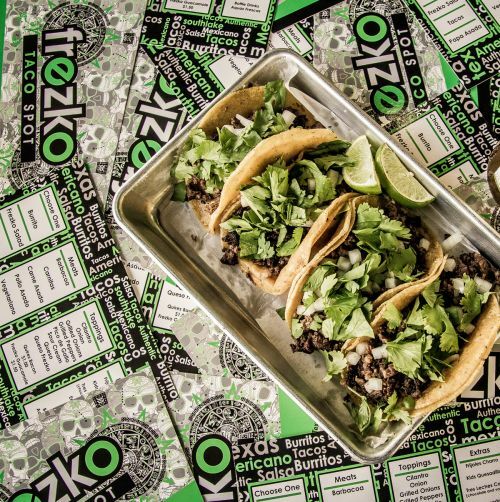 Since the beginning, Frezko Taco Spot has been all about family. Armed with his great-grandmother’s recipes and a lifetime of experience preparing them, owner Eliazar Salinas III set out to share his family’s vision of Chicano cuisine with families and friends across DFW. It’s in that family kitchen where he learned the importance of fresh ingredients, and that’s why we start each day with quality produce and locally-sourced meat, never anything frozen. That goes for our whole menu, from hearty street tacos to our famous aguas frescas. So grab a bite, kick back on our patio, and expect a warm family welcome every visit.